Despite some minor declines yesterday in the S&P 500 and the Nasdaq, every index ETF has held above their 50-DMA and are still sitting in a neutral range. 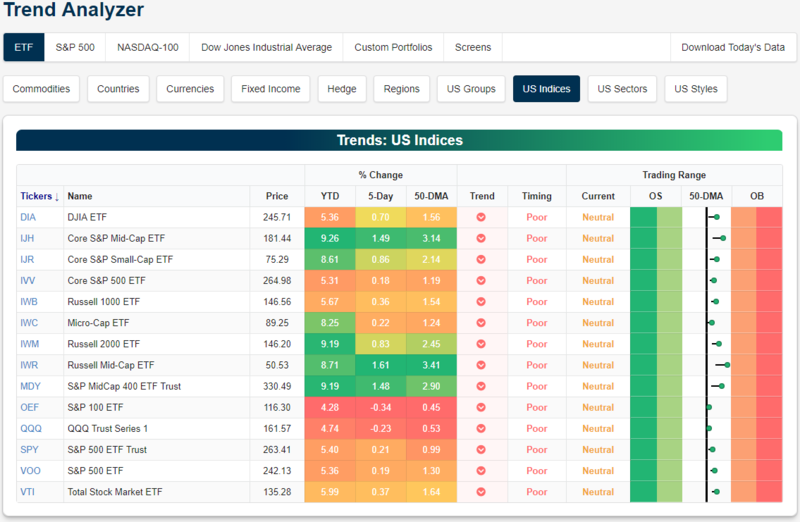 The large-cap S&P 100 (OEF) and Nasdaq (QQQ) are now the only index ETFs that are down from their levels one week ago. Mid-caps, on the other hand, have continued to rally. The Russell Mid-Cap (IWR) has gained the most at 1.61% over the past week and is very close to overbought territory. Just a little more upwards movement today could easily place the ETF into this range. While more firmly in neutral, the Core S&P Mid-Cap (IJH) and S&P 400 Mid-Cap (MDY) are both up just under 1.5% over the past five days. Additionally, these two are now the best performers on the year (MDY is tied with the IWM for second place).